I’m not liking the Psychic Tarot oracle deck at all. I mean, let’s just start with the above photo of the cards. Look at the quality. This is a brand new deck mind you. I bought it still encased in shrinkwrap. All that white stuff you see along the edges of the card backs is how these cards came, brand new. It’s a fortuitous thing that I got my hands on the Psychic Tarot for the Heart before this one, otherwise I’m not sure I would have had the mind to give the Heart one a try. 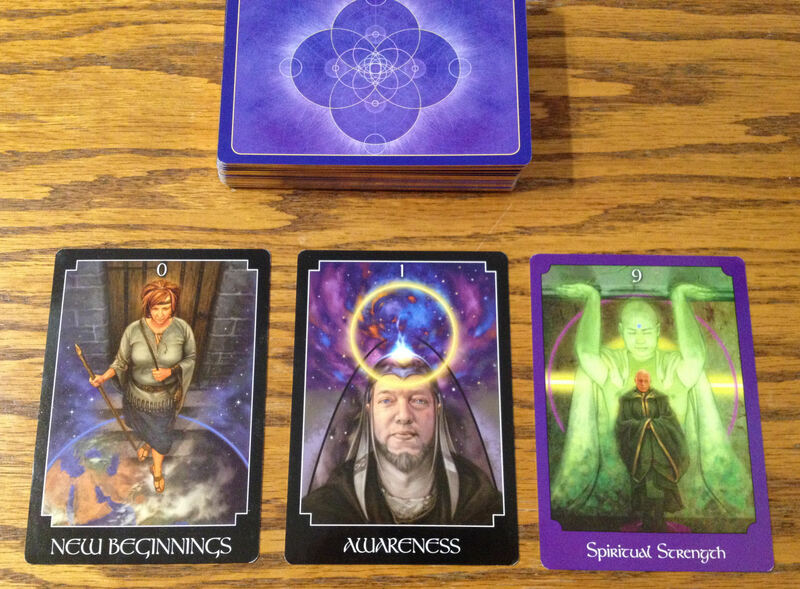 Earlier I reviewed Psychic Tarot for the Heart here. 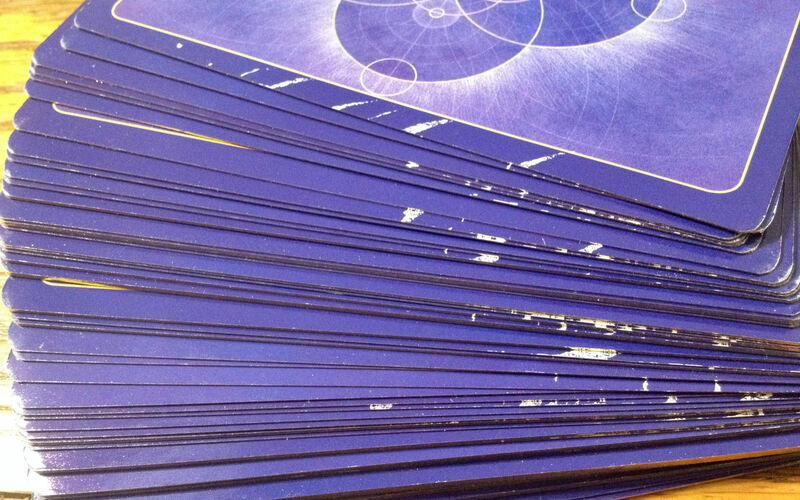 Here is a close-up of the cards. I’m digging the reference to sacred geometry on the card backs and throughout the packaging (such as the interior of the box that the cards come in), but if returning these cards and getting a refund wasn’t such a hassle, I have to tell you, that is exactly what I would have done. And…here’s the front of the cards. It wasn’t that the plastic wrap peeled the coloring of the cards off. That was my first hypothesis, but the plastic wrap was clear. It came like this! Many of the cards from the center of the deck, which wouldn’t have come in touch with plastic wrap or anything sticky, had that white scrape-y stuff. 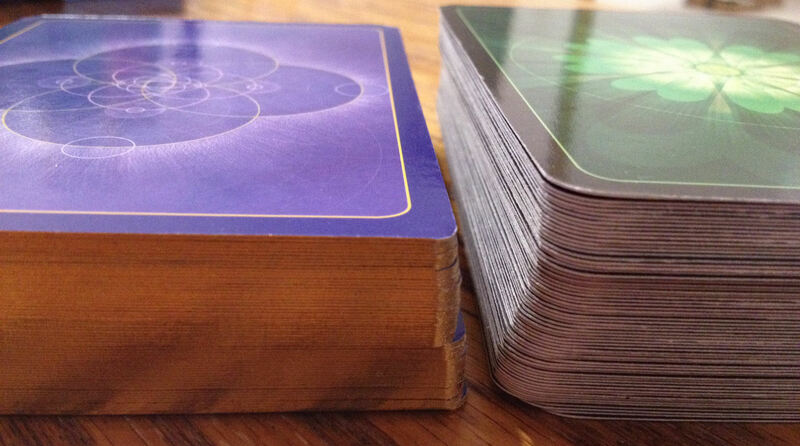 I believe both the Psychic Tarot and the Psychic Tarot for the Heart oracle decks have the same number of cards, but look at the thickness of the Psychic Tarot deck compared to the Heart one. Yes, I am dazzled by the gold gilded edges of the Psychic Tarot, but that wasn’t enough to appease me. I much, much, much prefer the Heart one over this deck. I’m so bummed. 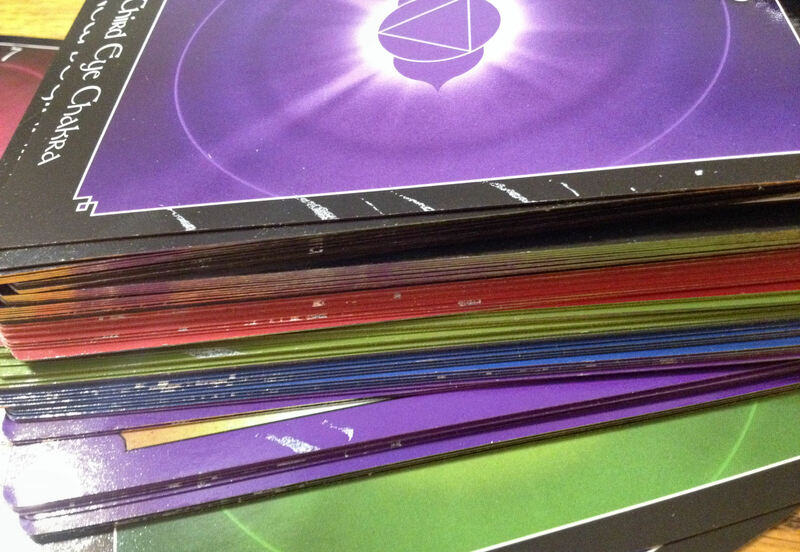 And the backs of the Psychic Tarot are so nice, too! The cards are 3.5″ x 5.0″, just like the Psychic Tarot for the Heart, also laminated, super-glossy, but unlike the Heart one, the Psychic Tarot deck is flimsier, though it does have those nice gilded edges. When I unwrapped them for the first time, all of the cards were stuck to each other. That’s always annoying. For my review of the Heart version, I showed Keys 0 to 5 (Fool to Hierophant), which had verbs as keywords. Here in the Psychic Tarot it seems like we’re going for nouns. The imagery in the cards deviate from all of the prevailing tarot traditions and the keywords sort of but not entirely follow traditional tarot meanings. Like at least for me, I don’t associate the Hierophant with wisdom. I mean, The High Priestess is going to get that title before I give it to the Hierophant. The Hierophant is about traditions, traditional values, conservatism, dogma, orthodoxy. Wisdom? The twin pillars imagery in the background of the card corresponding with The Emperor (and lack thereof in The High Priestess and Justice) also stumps me. But it’s okay, because the Psychic Tarot oracle is its own unique system of cartomancy. It’s in and of itself a great oracle deck that happens to share certain characteristics of tarot decks. 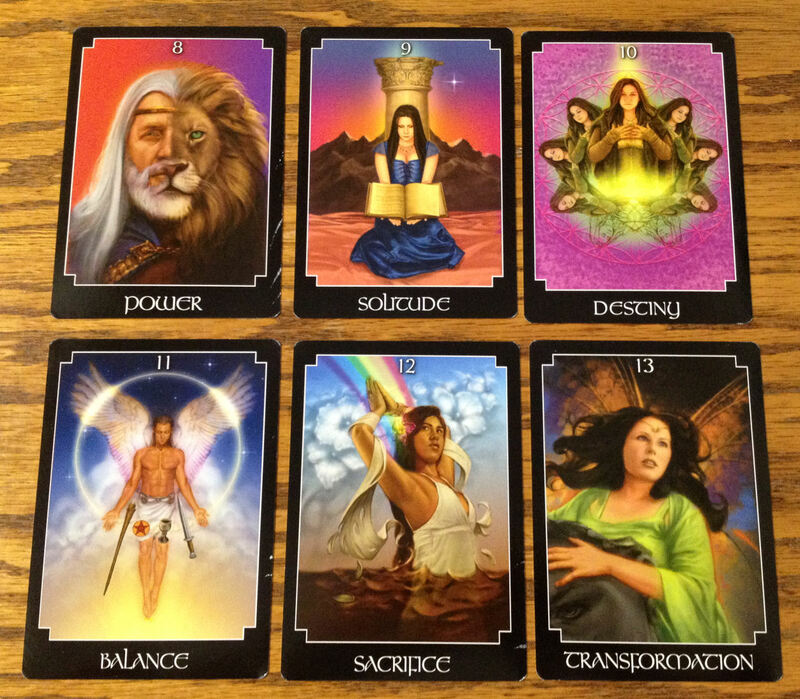 Thus, it isn’t exactly fair to judge this deck as a tarot deck, because it’s simply not tarot. Now, adjudicated as an oracle deck, the quality of the deck itself aside, it’s not bad. Here are some cards in the Majors I really love. I like Key 8, which corresponds with Strength, and I love Key 9, The Hermit. We see here it’s following the Rider-Waite-Smith tradition of numbering in the trumps. As for Key 11, Justice, a card that I often identify with, if you covered up the keyword and the number 11 up top and asked me to guess which card in the tarot deck that was, I have to say, I would have guessed The Magician. So that card, too, stumps me a bit. I like Holland’s concept behind Key 13, the card that otherwise corresponds with Death. I’m thinking there’s this whole transforming into a butterfly soon motif about the card, which works. I like. It’s a very, very pretty and soft image for Death, and personally (and very subjectively) I tend to prefer the power of the original imagery in the card in all of the three main tarot traditions better than some of these contemporary New Age renderings of the Death card. 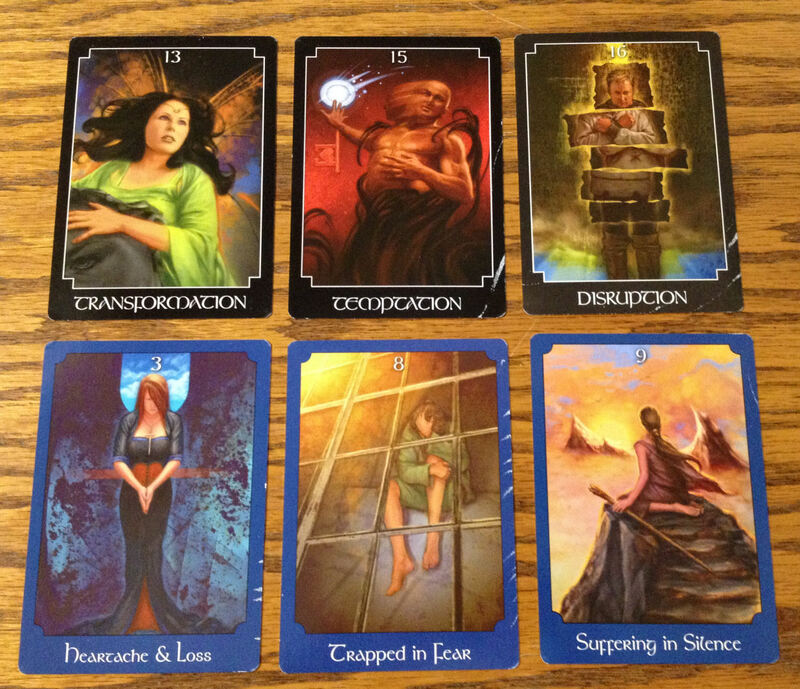 So let’s examine some of the cards that are often more difficult for the uninitiated to look at in tarot. There’s Death, Devil, and Tower respectively up top, and the 3 of Swords, 8 of Swords, and 9 of Swords in the bottom row. There are no cards corresponding with 10s in this deck, like in the Psychic Tarot for the Heart. I’m okay with the 3 of Swords, since you do get those keywords at the bottom. I guess because of the keywords, all three of cards depicted from the Swords suit work for me. The gentleness of the imagery in all of these cards would make it very child-friendly. Here are three more cards I really like, from what I believe is the suit of Wands. Like the Heart version, the part of the oracle deck corresponding with the Majors follow the Rider-Waite-Smith somewhat, Keys 0 to 21, for 22 cards. There are then four suits in the Minors, though only numbered 1 to 9. There are no court cards, and instead, we have 7 chakra cards. 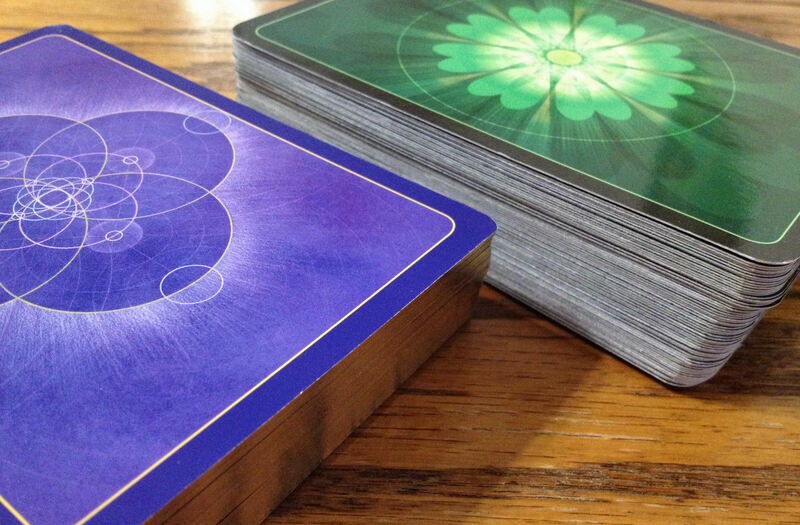 The chakra cards in this deck are exactly the same as the ones in the Heart deck, which were pictured in that review. Physical, with red borders, to correspond with the suit of Pentacles, Earth. Emotions, with green borders, to correspond with the suit of Cups, Water. Mental, with indigo borders, to correspond with the suit of Swords, Air. Spirit, with purple borders, to correspond with the suit of Wands, Fire. That seems to follow a system more grounded in Eastern chakra theory than Western esotericism or cosmology. For most tarot decks, Pentacles, or the energy of Earth, corresponds with the material plane, which is distinguished from the physical plane that corresponds with Wands, the energy of Fire. Also, when most of us see red, we’re going to think of fire, not the body, or Earth energy, which we tend to associate with darker, well, earth tones. However, if we’re saying the red borders relates to the root chakra, then that makes a bit more sense to me, since Holland is saying the red cards are about the physical world. Likewise, green, for the heart chakra, corresponds with the emotional plane. Now, indigo is often associated with the crown chakra, which is your connection to Spirit, or the Divine, so why it is Mental and Swords, I’m not exactly clear. However, I also am not an expert at chakras, so hey. It’s probably me. Personally, I might have gone with blue for the throat chakra to correspond with Swords and Air. Purple is the third eye chakra, which can work with a suit you are calling Spirit, though the suit of Wands is traditionally associated with creation, innovation, that go-getter energy, confidence, esteem, and the physical plane, so we’re talking about work and career matters, the physical body. To me, that has a bit of a solar plexus vibe, so I probably would have gone with yellow if I wanted to stick to chakra theory. I shuffled the cards thoroughly and drew three for a reading. It’s cool to see Key 0 and Key 1 consecutively, but let me go out on a limb here and say that wasn’t woo-woo that they were drawn in that order, but rather, the two cards stuck together. That’s the thing with this deck. All the cards stick to each other, making the shuffling process difficult for me. That said, nice to see Spiritual Strength again. I had just said earlier this was one of my favorite cards in terms of imagery in the deck. The great redeeming quality to this deck is the Guidebook. It’s a comprehensive Guidebook and yet it’s concise and easy-to-read. Like what I said about the Heart version, this is a fantastic deck for people who are intrigued by the idea of tarot and oracle decks, but probably won’t be delving too deeply into the study of tarot. It’s a bit hard for me to picture die-hard tarot people getting enthusiastic about this deck, but the imagery on the cards are beautiful and the keywords render it very, very easy to read and pick up on without any prior knowledge in tarot. In fact, I think if you’re highly knowledgeable of tarot, there’s going to be a disconnect between you and this deck. Weirdly, I believe knowledge of tarot works against you when working with the Psychic Tarot. Holland came out with the Psychic Tarot oracle deck first in 2009 and then Psychic Tarot for the Heart in 2014. The Psychic Tarot for the Heart is way better. By leaps and bounds. I just didn’t connect with the original Psychic Tarot oracle, which arrived at my doorstep with this kind of flat, almost atrophic energy to it (and I don’t know if it was just the deck I happened to get or if it’s the Psychic Tarot generally), whereas the Heart version had a great overall vibe and lively energy to it. 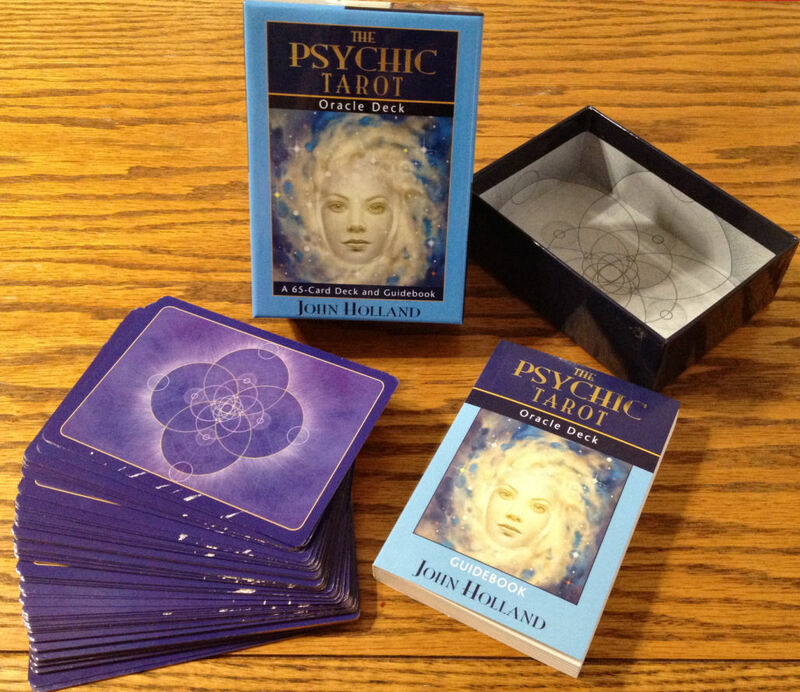 John Holland’s work is amazing and a deck collector is going to want at least one of his decks in his or her collection, and if you’re going to get just one, may I recommend the Psychic Tarot for the Heart over the original Psychic Tarot oracle. What a bummer, Benebel, that the Psychic Tarot arrived at your doorstep in such a sorry state. I would venture to guess that it had probably been sitting in a warehouse for a period of time…………..I have both decks, and I agree with you when it comes to the quality or lack thereof in card stock between the two……………..I did not realize that the Psychic Tarot had a thinner card stock in comparison with the Psychic Tarot of the Heart………..but I do love the gold gilded edges of the Psychic Tarot……….and since I haven’t put forth the effort, time and scholarship that you have, I can slide into both decks without noticing all those finer points. For me, it is simply a matter of walking into the card, and these images are certainly pleasant. Thanks for your review and all that you do. Looking forward to Saturday afternoon (at 1 p.m. here in New York)……….I’ve never been to a Webinar before. See you, then. Thank you, helped me made up my mind definitely not to…. I bought the French version of the Psychic Tarot oracle a few years ago (no problems with the quality of the cards) but I don’t use it that much. I like the chakras cards but I am not a huge fan of the writings at the bottom of the cards which interfere with my imagination. I’ve started putting black tape on it ^^. I completely agree that professional readers are not likely to appreciate the words on the cards. In tarot, for example, I dislike it when there are keyword captions. They’re distracting. Benebell what a snobbish comment to make. Theres no such thing as pro reader. Wow, that is truly an insult. Every reader with 20+ years of experience ive gone to has words on their cards. There is no such thing called pro in tarot reading. There is only pro in tarot making. Buddhists don’t call themselves pros, no Christians call themselves pros in practicing bible and same as satanists. The deck choose you. It’s about connection. Psychic tarot for the heart is a beautiful deck but it seems not having connection with me. IT’s a shame you don’t like this deck and that you got a bad batch from the printer. 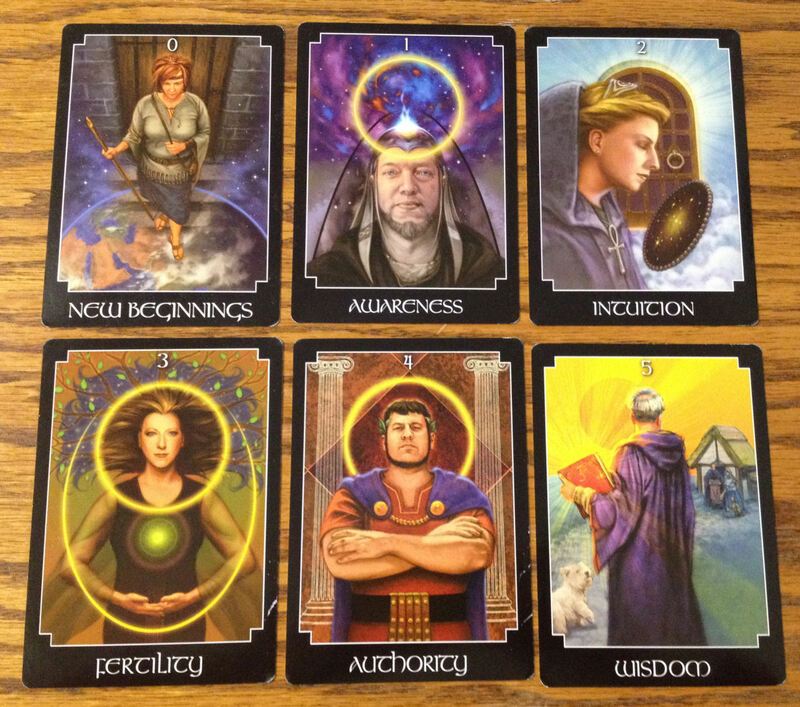 My cards are fabulous and I love the different nature of the cards and his system. Don’t throw the baby out with the bathwater is all I have to say. I love this deck, love love love it!.